Tricia excels in giving our patients an excellent experience, and is able to assist them with any questions they might have concerning the services we provide. She thrives on being able to know our patients one-on-one, will work to schedule an appointment time that is convenient for you, and will be there to greet you with a smile. 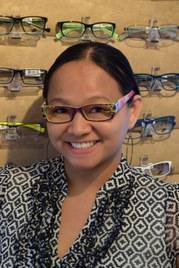 Her experience in customer service began over ten years ago where she worked in the medical field and recently transitioned into the optical field. She’s knowledgeable of most insurance benefits. Outside of work she loves to spend quality time with her husband and four beautiful children.